Greece is often associated with the ancient ruins of Athens and the dazzling sunsets of Santorini, but the country is filled with endless hidden gems and well-kept secrets. 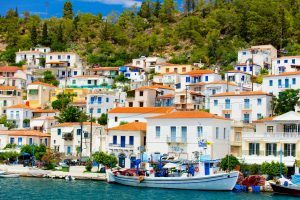 Learn more about the Greek Isle of Poros, and discover five reasons to add it to your travel list. Similar to other cities in Greece, Poros is built upon the slopes of a hillside. The town is drenched in neoclassical architecture, resembling an ivory staircase in an amphitheater. At the top of the highest hill of Poros sits a clock tower, built in 1927. A brief hike to the top of the tower provides travelers with the best view of the city, sunset, and sparkling blue water. During the summer, the beaches of Greece can become crowded with tourists and locals alike. If you’re looking for a more intimate experience, Poros is the place for you. Escape to Askeli, the largest beach on the island, for water-skiing and a lively nightlife. Or take a taxi to Love Bay, and swim under the pine trees and pink bougainvillea. The ruins of Poseidon’s Temple, built in 520 BC, lie in the north part of the island. During the 18th century, most of the ruins were dismantled. Some of the materials were used to build a monastery on Hydra, and other relics are now located in the Archaeological Museum of Poros. Just four kilometers east of the city center lies the old historical Monastery of Zoodochos Pege of Poros. The Archbishop of Athens Iakovos II founded the monastery in 1720 after he was miraculously cured of lithiasis in Poros. The monastery is considered one of the most popular attractions in Poros, and travelers enjoy the quiet refuge away from the beaches and towns. Sailing is plentiful in Poros, and several different companies organize a variety of boat trips for the adventurous traveler. Take a short trip to the Saronic islands, or spend the afternoon on the coast of Peloponnese. Have you always wanted to learn to sail? Why not take your first lesson in Poros? Visit Greece on the Great Escape and Explorer tours, or spend an entire week exploring the country and surrounding islands on the Greek Island Odyssey tour! This entry was posted on Wednesday, May 16th, 2018	at 9:34 am	. You can follow any responses to this entry through the RSS 2.0	feed. Both comments and pings are currently closed.